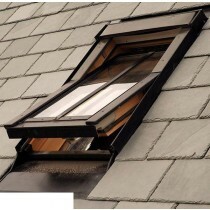 Centre pivot roof windows are a classic window design, popularly used with loft conversions and house extensions. This is due to installation being possible on roof pitches from 15 to 90 degrees. Still the most purchased design for roof windows, we offer a wide variety of options including double glazing and triple glazing with a white, pine or conservation finish. 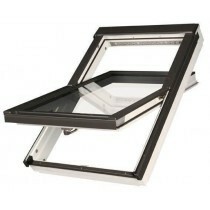 Therefore, you’re certain to find the ideal centre-pivot roof window for your project. Whether you’re looking for a simple design or a window system with all the latest mod-cons, you’ll find the right option for you at Roofing Megastore. Windows with natural pine, white PU-coated pine and PVC frames are available. For the very latest technology take a look at the Fakro full electric control window, complete with actuator, rain sensor, and semi-automatic pressure ventilation to prevent wind gusting. 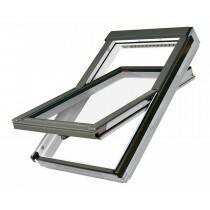 We also offer highly energy-efficient windows suited to airtight construction. All of the centre pivot roof windows listed can be rotated through 180°. This allows you to easily clean the inner and outer pane from within the room. This ensures that you can maximise the light transmission of your newly fitted windows throughout the year. For maximum security, there are windows in our selection with burglar–resistant glass with extra tempering and anti-burglary class laminate. Together with strengthened glass, they also include a reinforced hinge and innovative locks. 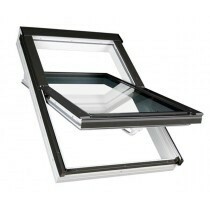 Have Questions About Our Centre Pivot Roof Windows?